Above all else, playing EVE requires time. Skill training, scouting for enemy fleets, setting up tactical bookmarks, collecting resources for production, generating income and many more activities have built-in time requirements. How much time we have is also the one thing in our lives which we have no ultimate control over. Even with a healthy lifestyle with no risky activities, in a peaceful country, we could become the victim of a multitude of circumstances which cut our lifetime short. No matter how much love, friendship, satisfaction, money, fame or power we might accumulate in our lives, nothing will stop the inevitable. I have often thought about what makes EVE players act in certain ways that mirror behavioural patterns which can be observed in real-life, despite EVE being “only a game”. A possible answer to this question could be the role time plays in our lives and how we are all conscious of its limited nature one way or the other. To deal with this, players have developed many ways to optimise the time they dedicate to the game. We all try to get the most out of the game by following principles such as ISK/hour, fun/hour, time to content and other more-or-less subjective metrics. This time-management effort is one of the most significant factors in determining player behaviour. Time is the school in which we learn. Time is the fire in which we burn. These beautiful lines by poet Delmore Schwartz apply directly to EVE. In the time even more broad and complex games can be virtually exhausted for content, an EVE player will barely scratch the surface. Even the often criticised PVE content in EVE offers significant amounts of gameplay until all missions, DED complexes, sleeper sites, Incursions and exploration sites become repetitive. Acquiring the skillpoints and ships necessary to effectively play that content also requires time, and then there is of course the player skill required to survive. Despite all the aids that are out there, players still lose ships to NPCs. To avoid that, a player needs to gain experience. No matter how much real-life money a player spends on Skill Injectors and PLEX to gain all the in-game prerequisites, experience does not develop overnight. Even at this rather simple level of gameplay we encounter a significant behavioural pattern. When faced with the limitations of time, we often attempt to compensate with money. In real-life many are willing to pay more for food that promises better health. Those of us who can, will afford gyms, therapies and medical treatments in the hope to extend the amount of time we can live a good life. We spend money on parties, celebrations, entertainment and travel to enhance our social life and to enrich our daily experiences. Many people also invest in security to protect themselves from accidents or attacks, again in an effort to reduce the risk of premature demise. We can find this behaviour directly reflected in EVE, and in fact CCP have facilitated it ever since they introduced PLEX. With further features like the Character Bazaar and the Skill Trading System they have expanded the possibilities to trade money for time. The results confirm the effectiveness of this business strategy. CCP’s CEO is talking about “record profits”, despite a stagnating PCU. Throwing money at the problem only partially solves it though. As the quote from the poem says, time is also the school in which we learn. We can only get so far in making ourselves more “fireproof”. EVE is a game of such breadth and complexity, that developing the skills to master any given activity requires time for research and practice. No amount of ISK or skillpoints can buy the inspiration for a fit that can tank all the NPCs in a mission site while decimating them as quickly as possible, or the ability to win a fight through skillful fleet command. Hence, every EVE player faces an optimisation problem where they have to balance expenditure of money and the time it takes to learn the necessary skills. Many players will fail at this in one way or another. Some will attempt to solve everything with money only to realise that an inexperienced player with an expensively fit Marauder can die easily to a more skillful opponent with a much less powerful ship. Others commit themselves to a senseless time-wasting grind only to reduce the amount of money spent on the game. The reason that happens is, because many simply assume that time can be directly quantified in terms of money. I have heard many players say that their income is sufficient to pay for a PLEX and turn it into ISK so they can afford what they need to enjoy the game fully according to their preferences. The calculation they make in that case is to compare how much time they have to spend working for the money the PLEX costs, as opposed to the time they’d have to spend to make the same amount of ISK in the game. Time is the optimisation target they are going for, but as I have said, this is not simply a one-for-one exchange. There is also a minimum of time that needs to be spent in learning and practicing the game, and that makes the optimisation problem more complex. Time optimisation is not only significant for financing in-game activities though, it also plays a major role in determining behaviour during player interaction, especially PvP. The tactic which is often called “weaponised boredom” or “content denial” is applied on all levels of EVE gameplay. Non-combative high-sec corps will often lay low and strategically not engage wardeccers, lest they provide the aggressors with the fights, tears and satisfaction they are looking for. Baiting an opposing party to form up for an attack only to have them realise they did it for nothing is a time-honoured tactic in EVE. It even has its own game-related slang-word: blueballing. Playing for time in an effort to burn out an opponent has often been applied in sovereignty warfare; some organisations have even turned it into a strategic doctrine. In all those cases, the goal is to waste the opponent’s time. It is not simply an in-game method to destroy the enemy’s assets, but rather an attempt to affect the parameters of a player’s personal time optimisation model. This becomes particularly effective if the opponent can be forced into repetitive actions which yield them nothing but cost them time. If we return to the quote from the poem, then a successful application of this tactic completely negates the benefit of spending time to learn new things. “The school in which we learn” is rendered inoperative, but “The fire in which we burn” consumes us to the same degree. Just as the time-for-money calculation used for financing and facilitating the hobby of playing EVE has its pitfalls, so does the tactic of “weaponised time-wasting”. Sitting out a wardec and denying the opponent content might work to detract them from keeping up the effort, but it can also weigh heavily on the players of the defending side. Especially for new players it is often hard to deal with the idea that they are better off not playing the game. Many CEOs of highsec corps will actively deter players from fighting under a wardec, even if they could learn something from fighting against the opponents. In the very least they would learn how to cope with ship loss. They are denied the opportunities of “The school in which we learn” at a period of their EVE player career where they need and also desire it most. On the level of larger alliances, limiting doctrines to supposedly burnout-inducing troll tactics can backfire too. The recent major conflict which played out in EVE provided an example of that. When Goonswarm (GSF) leadership identified Pandemic Horde (PH) as the weakest link of the enemy coalition, they employed tactics which were designed to burn PH out with repetitive attacks. In the end the GSF negatively affected itself more than the opponent, and again our perception of time offers an explanation for that. Age plays a major role in the way how we perceive time. As we grow older we become increasingly aware of the amount of past that lies behind us while simultaneously realising that the time which we have left grows shorter. Our ever-extending memory is likely to contain a number of setbacks and choices we regret. Maybe even things that we enjoyed when they happened, but which we would not care to repeat. This applies to our life as well as to our gameplay. With experience, EVE players learn which things are not “worth their time” and they try to avoid them. At the same time, older players are more likely to have extended real-life responsibilities: a family, a job, a mortgage, an elderly relative to care for, and many more. A younger player is not simply more unbound though. For them, even simpler challenges are new, and they don’t yet have a large number of experiences in their memory which they would rather avoid. This combination of factors will often lead to younger players immersing themselves more completely into the game. Hence, when Goonswarm intended to burn out Pandemic Horde with repetitive light attacks, they provided actual content to the young eager pilots while many of the older GSF members felt like they were relegated to repeating an experience which they have left behind. When The Mittani declared that this was the form of warfare Goonswarm had successfully applied in the past, he failed to account for the fact that older players are likely to be more discerning in how they spend their time in the game. One cannot simply expect to repeat strategies and tactics which worked with a player community that was five to ten years younger and more reckless in their time management. Over the years their time had become more precious. Don’t worry, I do not intend to make a case for e-bushido when I quote from this classic treatise on the Samurai way. What it does express nicely is the futility to fret about the inevitable. Tsunetomo talks about being resolved, committed to a course of action, even when it means that we have to face the metaphorical rain. This attitude is also reflected in the western philosophical phrase Carpe Diem – Seize the Day. Although this phrase originates with the Roman poet Horace, it was revived during the European Age of Enlightenment. 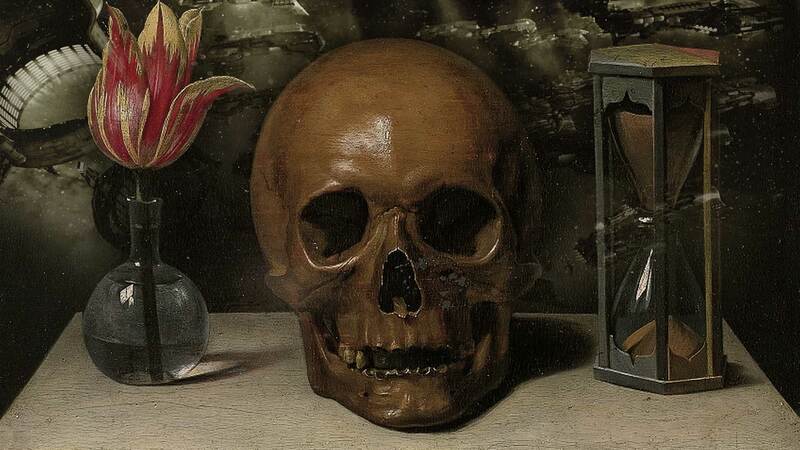 Carpe Diem was the answer to another philosophical catchphrase of the time: Memento Mori – Remember that you will die. With religious stricture becoming less overbearing in the 17th and 18th century, people began to look at life as something to be lived to the fullest and enjoyed. Indeed, we are mortal and our life could end tomorrow, but that does not mean we should get lost in somber reflection on death or – even worse – live in fear of a divine judgement that might never come. Just like Tsunetomo, the poets and philosophers of the Enlightenment rejected the idea to constantly be obsessed with death and mortality, but rather accept it as a fact of life and deal with it. This way of thinking can also be applied to EVE, and many do so. When players pursue “content” or “good fights” in PvP, they want to seize the day and enjoy themselves. Others may enjoy the sense of achievement that comes with a perfectly optimised production chain, or a completed Incursion. I support the ideal of “Life, Liberty and the pursuit of Happiness”, as the American Declaration of Independence puts it, a document infused with the philosophy of the Enlightenment and the concept of Carpe Diem. As a result, my conclusion is that in EVE gameplay – as in life – we should follow the path that brings us new experiences and enjoyment, especially because this is a game. Since it is a game, we are completely free from the material constraints of life, and only the fact of our limited time directly crosses the boundary between the virtual and the real. So we should use that time in the way that leads us to the greatest enjoyment of the aspects we personally like about the game. We would do the rest of our lives a disservice if we forced ourselves to endure frustration and the feeling of wasted time in our hobby.